Valentine’s Day falls on a Saturday this year, so why not pass on getting sucked into the commercial hype of it all and show your love with a unique breakfast treat. This looks great just out of the oven and tastes even better. 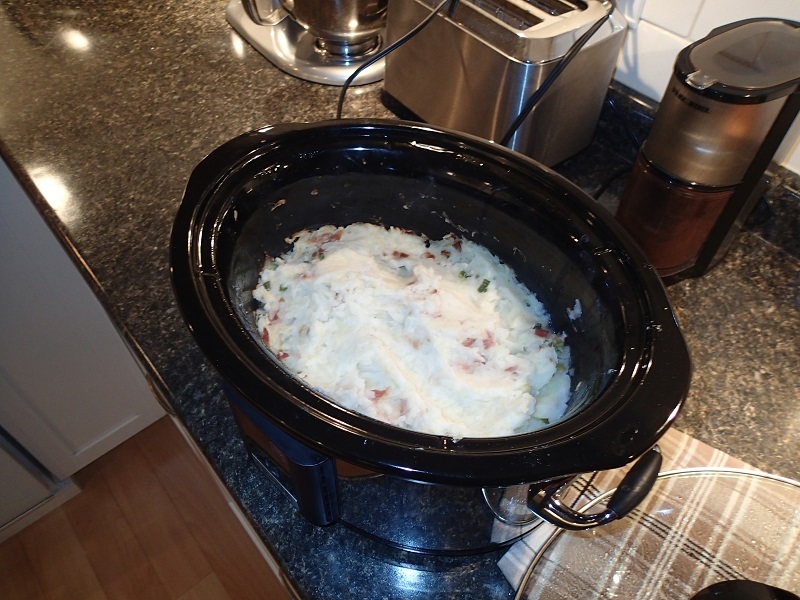 I adapted this slightly from a recipe given to me by Mary Wallgren, from the Idaho branch of my mom’s family. You will need a blender and also a cast iron skillet. 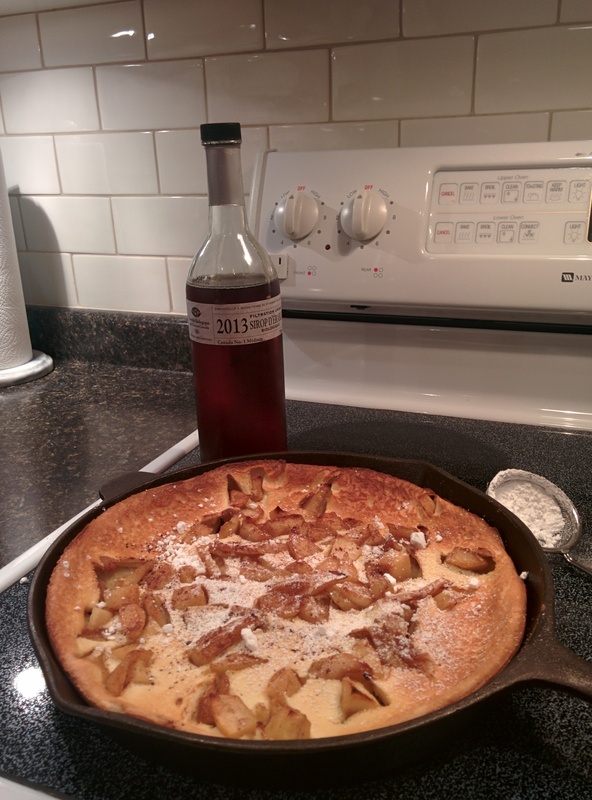 If you don’t have the skillet, perhaps you should? Next thing you know you will be making frittatas and oven-fried chicken. If you are really frugal, pick up a grotty cast skillet at Value Village and recondition it. There are instruction for this process on-line. It is a bit of a dirty job. In a bowl, stir together apples, cinnamon, brown sugar and lemon juice until apples are coated. Melt 2 T butter or margerine in a regular skillet on the stove top, add apples and saute until apples are tender – at least 5 minutes. Turn off heat and set this skillet aside for now. Place your 11 inch cast iron skillet into cold oven, and set to 400 degrees. Now, into blender put your three eggs, and blend really well. Reduce blender to low speed. Add flour, salt, granulated sugar and orange zest. Stop blender and scrape down sides to ensure all flour is being combined. Blend again for one minute. Carefully remove cast skillet from oven using two oven mitts. Place on cold stove top and add 3 T butter or margerine, moving it around with a spatula until melted but not browned. Carefully add batter from blender, then distribute cinnamon sugar apples on top and return to oven using two oven mitts. Bake 25 minutes, until edges are puffed and brown. Test centre with finger to ensure fully cooked. Dust with icing sugar, cut into wedges and serve with maple syrup. Caution: Don’t forget and touch the pan. Hot! Ready for a taste of summer? This is it. 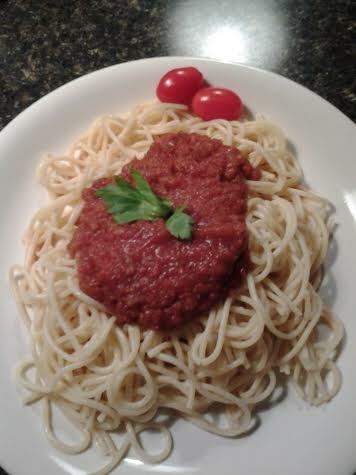 The natural sugars caramelize to give this easy sauce a sweet, straight-from-the-garden taste. 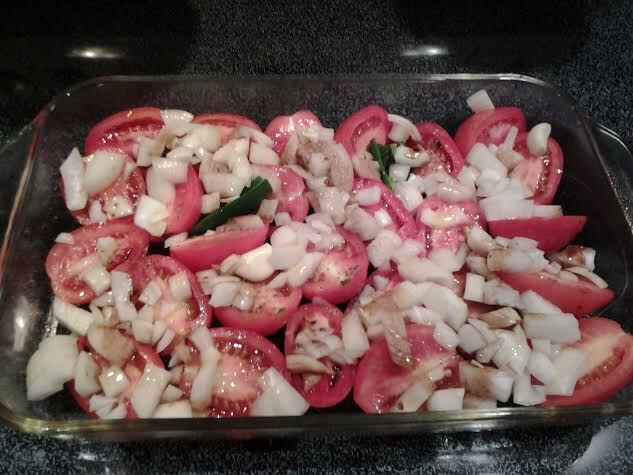 Cut tomatoes in half lengthwise and place cut side up in a single layer in a large spray-oiled casserole. Toss in a half dozen peeled whole garlic cloves and a chili or two. Sprinkle with salt and pepper, and that big onion, chopped. Drizzle generously with olive oil, and less generously with balsamic vinegar. Pop it in the oven at 275- 300 degrees uncovered and let it all roast for at least an hour and two is better. Remove from oven and cool slightly. Transfer to deep bowl and use an immersion blender to combine – but not too much, as you want it to have some texture. Add a bit of that red wine to deepen the flavours. Heat 10 minutes, adjust seasonings to suit and serve over your favourite pasta. 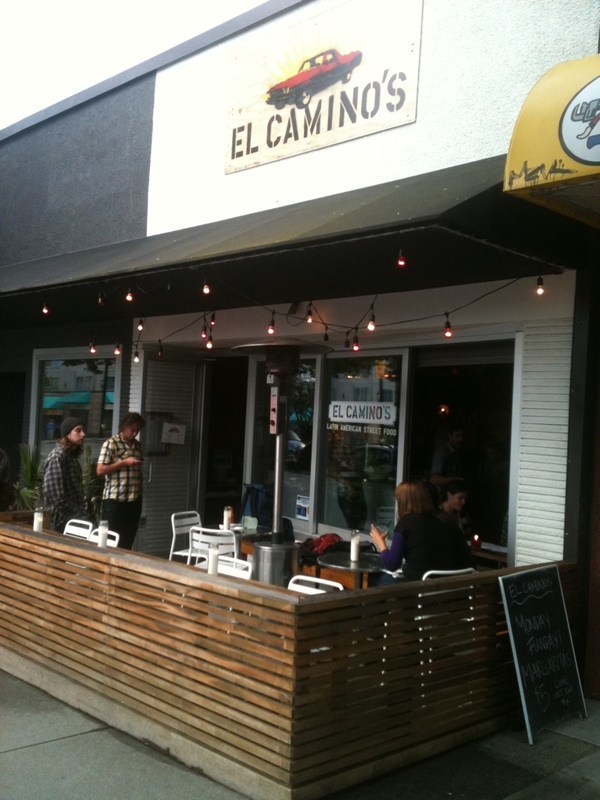 Spent part of this evening at El Camino’s on Main – where all the hip people are if you’ve been missing them. Subtitled as Central American Streetfood. Packed on a Monday night when decent 2 oz margaritas are 5$. Tapas size portions great for sharing. Awesome music too – if you have great hip retro tastes like me, that is: vintage Bowie, the Knack, The Cars and Blondie. Very cool crowd, but we got good service even without toques, porkpie hats or large colorful spectacles! The Cottager is technically Irish, so with St. Patrick’s Day falling on the weekend, it seemed a good time to invite the neighbours in. Everyone brought something, and it was a fine meal with lots of laughs on the side. 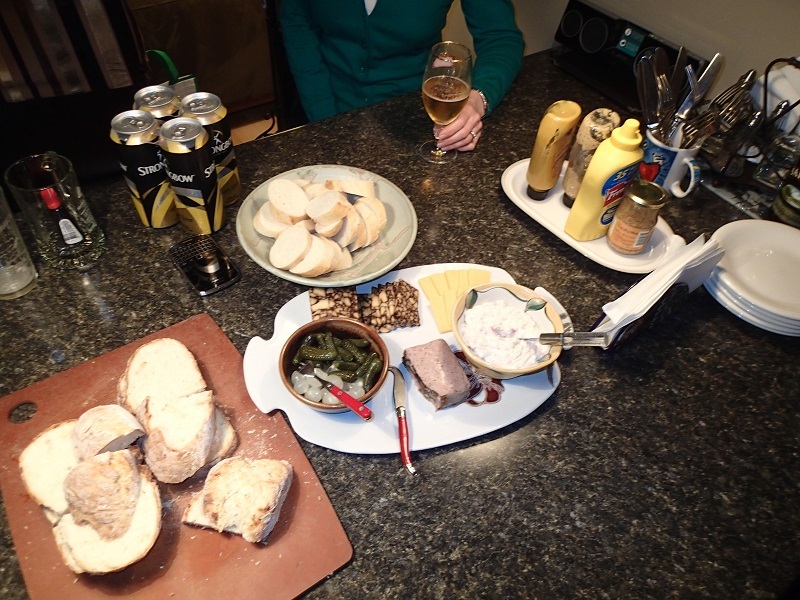 We started with a cheese plate featuring marbled Guinness cheese. Very pretty and mild. Andy made soda bread, which arrived warm. I made a dip with corned beef, dill and cream cheese. 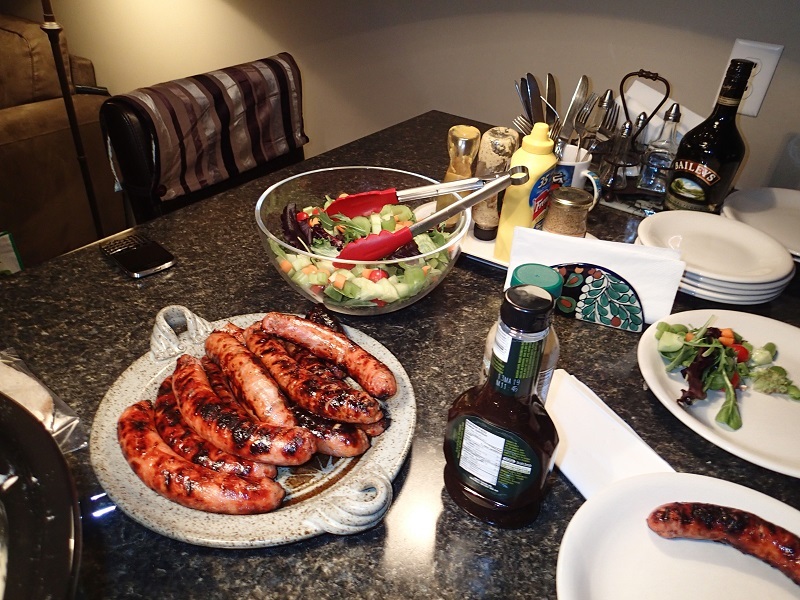 Next up was two types of barbecued sausages, served along with brown onion gravy, green salad, and colcannon, a traditional potato dish with cabbage and bacon mashed right in. Then there were two great cakes. 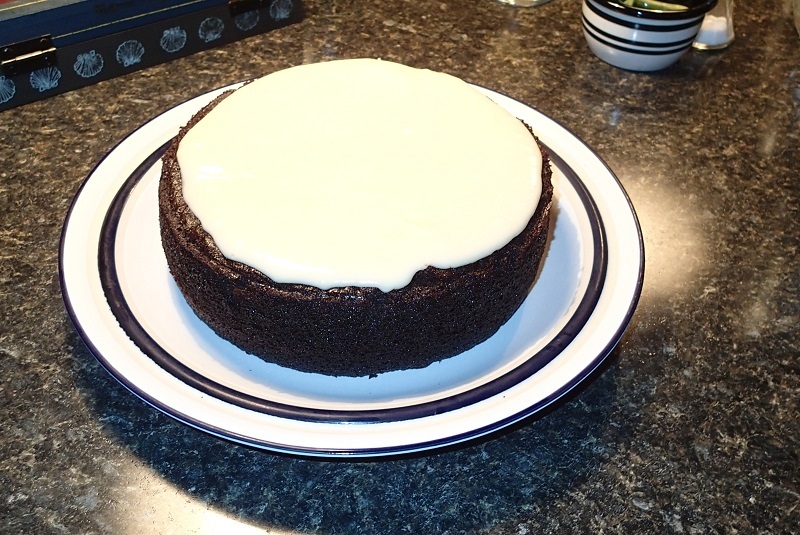 I made Nigella Lawson’s dense Chocolate Guinness cake – I’d make it again, but I would try it in a tube or bunt pan another time as it sunk a bit in the middle. 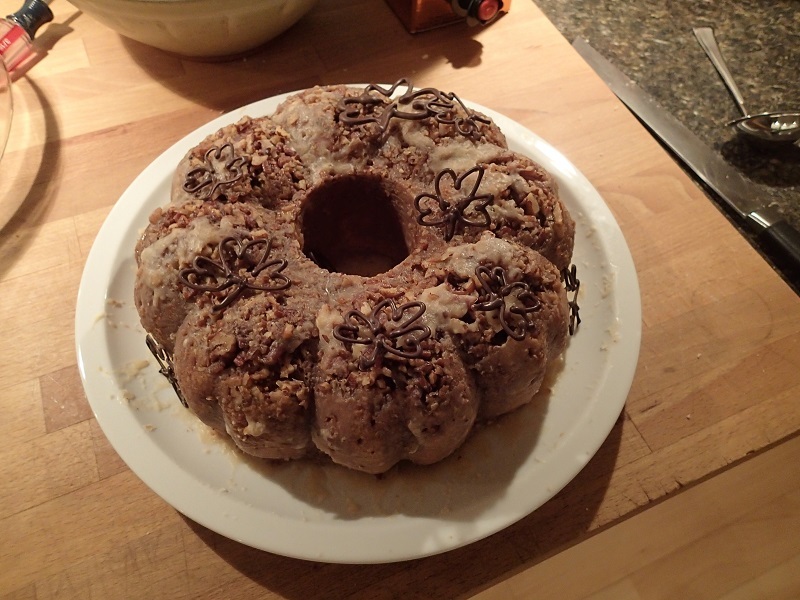 It has a cream cheese icing that makes the cake resemble a glass of Guinness. My neighbour, Margaret, made a fabulous Bailey’s cake that apparently starts with a yellow cake mix but took it to another level. When I get the recipe I’ll post it. So It Falls To Me? To find the wonderful in Toronto? Me, who has been here for less than two weeks? 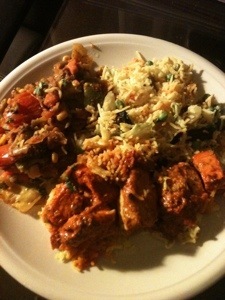 OK, lets start with the two things I mentioned: A good pub and some decent Indian food. I found the pub just across the street. It’s the Irish Embassy. 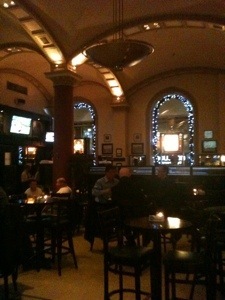 Handsome and friendly barkeeps – including at least one with an authentic Irish accent – have made me very welcome there. It doesn’t meet my “pint for less than 7$” criteria, but in every other way it is splendid. I had some of the best chicken fingers ever there, and they happily brought me a bowl of curry sauce for my fries when I saw it was paired with another menu item. There is a sister-pub called PJ O’Briens just around the corner, and they have live music on the weekend, so I will check it out then. 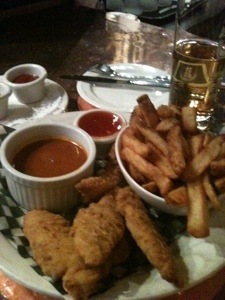 Meanwhile, here is a picture of my chicken strips, and another of the pub itself. As for the Indian, I noted four Indian joints in a row on Queen Street at University, which is not far at all. TripAdvisor was my friend here, singling out two of them for good reviews. I chose one of these, Little India, and was not disappointed. The daily special was a $19.95 menu that started with a vegetable samosa, added four other dishes, including THE BEST butter chicken I have ever had, and finished with a warm sweet. I was too excited/hungry to take a picture but here is a shot of just the leftovers from my meal, which I polished off last night. Great value. Good location. Criticisms would be that the vegetable dish was craaazzzy hot (as in spicy) and they burn an incense which – to me anyway – is incompatible with a restaurant. Just too smelly, but I am sensitive. Where to start? Where to go? What to see? Paris offers so many possibilities, but it is a really big city, and if you aren’t careful you can spend most of your time trying to get from one marquee attraction to the next. Even off season, attractions like the Louvre and Gare d’Orsay are very popular. In fact, off season, you are likely to encounter a lot of school groups: Not always conducive to the contemplation of great works of art. Throw in a lot of standing in line and some pricey tickets and a day in Paris can leave both you and your wallet feeling a little drained. It’s been quite a few years since I was in Paris with time enough to do some sight-seeing. Even longer since I visited the Louvre or climbed the stairs at the Eiffel Tower. Did you know there are 35,000 works of art in the Louvre? To look at everything would take about 9 months of full-time effort. About eight and a half million people visit every year. I like art but I like it best when it sneaks up on me; when I stumble on a little gallery, or open someone’s coffee table book to find something wonderful and surprising. The last time I was at the Louvre, it was a less than pleasurable experience that left me feeling fraught. Since it’s the most visited museum in the world, I decided my absence would not be noted. Instead, I decided to find a few less celebrated attractions conveniently located in one neighbourhood. The Marais was my choice for a full day outing. The name Marais means swamp and the land was once swampland adjoining the Seine and nearby Ile de la Cite, where Paris started out as a village inhabited by the Parisii tribe. The historic neighbourhood is charming, with narrow streets and interesting shops. It was originally the preferred location for aristocrats. It later became, and remains, a popular Jewish quarter. More recently, both the gay community and Chinese immigrants have become increasingly established. The result is an eclectic mix of shops, restaurants and night spots. In other words, something for everyone. I loitered for hours, often finding myself alone in one of the numerous exhibition halls. It’s in the center of town, it’s full of interesting historic items… Did I mention it’s free to enter? Oh, and that it has a pretty garden where you can wander around when you need a little break and some fresh air? 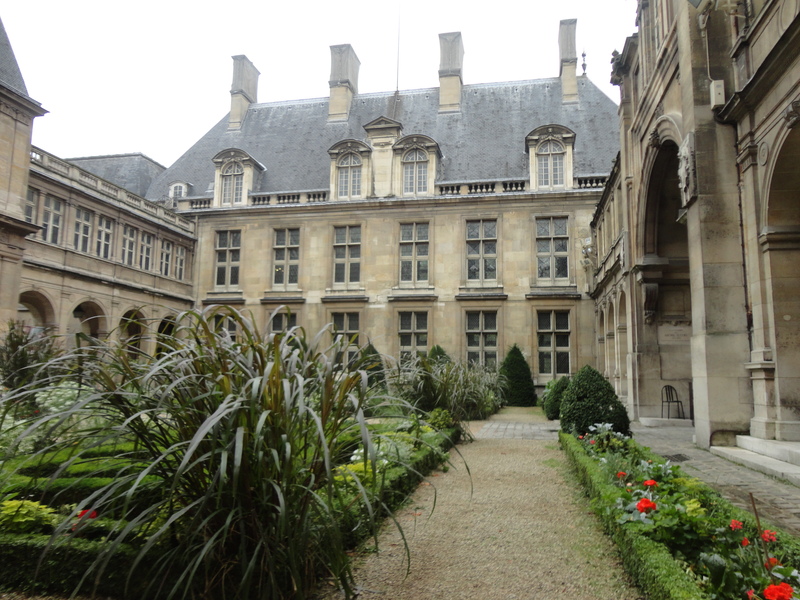 By the time I had seen all the Carnavalet had to offer, I was hungry. A few blocks away, on quaint Rue de Rosiers, is the city’s most famous falafel shop (and a number of imitators.) Don’t let the line up in front of L’as du Falafel discourage you. It moves fast. Runners took my order and money in exchange for a chit while I waited in line. Once at the window all I had to do was answer yes or no to the question “spicy sauce?” It wasn’t overly spicy and added a lot of flavour. A massive veggie-laden falafel sandwich and a can of Heineken cost 8 euros. I found a quiet bench in a pocket-sized park two blocks away and devoured it. After which I felt ready for the Shoah Memorial and museum depicting the history of anti-Semitism in France, the rise of Nazism, the crimes of the Vichy government and the events surrounding the deportation of Jews, more than 70 thousand of whom are listed on the memorial’s walls. The exhibits here include a reconstruction of the collection of file cards kept at one time on every Jewish person in Paris, as well as a picture wall of deported children. The crypt, in which ashes from concentration camps has been interred with Israeli soil, is peaceful and quite beautiful. This exhibit is also free to enter. While the subject matter is horrifying, it is well-presented and I recommend a visit. Afterwards, I perused some of the local boutiques of the Marais. The Picasso Museum and the Pompidou Centre were both in easy reach, but two was enough. And Paris by Night lay just ahead! That’s what we learned to do. And also consult Tripadvisor! The thrill of maybe discovering a great restaurant on your own wears thin after a few consecutive failures. Once we started to consult the gurus we never missed. While traditional Czech food tends to lovely roasted meats swimming in gravy with dumplings, potatoes or creamy salads, we also found terrific Indian at an outdoor terrace near the pricey Old Town Square as well as lovely pizza (this last on a floating restaurant with views of the castle.) We had terrific food at great prices along with good service! Together with all the beautiful sights and the pedestrian friendly and bustling vibe, my visit to Prague was really enjoyable. 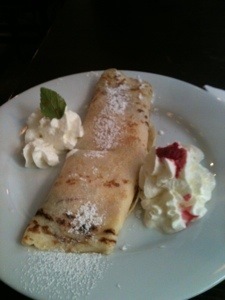 Now off to Paris for a few days but I won’t leave you without a few food pictures! This was our lunch yesterday at U Parlementu. 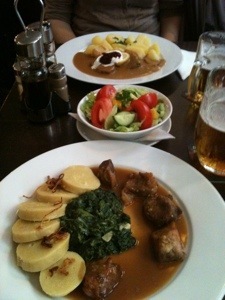 I had roast pork in a luscious gravy, along with spinach and bread dumplings. AB had beef sirloin in a cream sauce (which looks like gravy) and buttered boiled potatoes. We shared a Greek salad and a crepe-style dessert and we each had a beer. Our bill came to 427 Crowns which is approximately 18 Euros or CDN $23. Best of all, the server was friendly and really helpful. He didn’t tip himself, but we sure did.